PS4 and Xbox One frame-rates - plus a look at the game's visual effects settings menu. The finishing line is in sight. Only a day remains until Project Cars becomes a finished article on PlayStation 4 and Xbox One, an accomplished racer with beautifully detailed cars, plus an impressive real-time weather dynamic. There's a sense Slightly Mad Studios is pushing each platform as hard as it can while still angling for 60fps, though to cut to the chase, neither PS4 or Xbox One gets a perfect lock on this figure. But given its suite of options, which race setups give us the best frame-rate, and where is the engine at its most fragile? 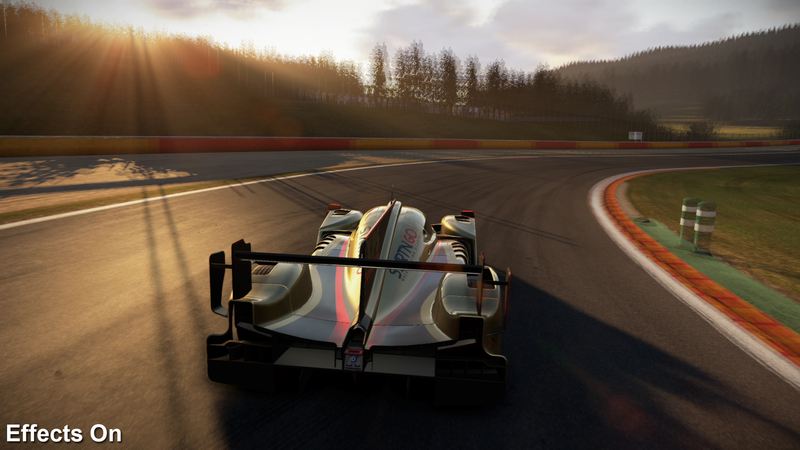 With the final retail release to hand, Project Cars' initial install weighs in at around 19.5GB for each console. In its default state, this precisely matches the size of the build tested in our original hands-on - though a day one 817MB patch on PS4 increases its HDD profile, and bumps the version number up to 1.01. A smaller 482MB update is also required on Xbox One, and it's impossible to play anything besides one track in solo mode until the update is finished on either platform. We intend to look into Project Cars visuals in greater depth with the upcoming Face-Off, but certain points bear mention right now. Firstly, Xbox One still retains a curious advantage in texture filtering, where static screens show PS4's roads blurring over at a closer proximity. Added to that we also see the same motion blur effect on PS4 as before, with moving objects producing an unusual banding behind them - while Xbox One's blur is more refined (UPDATE 6/5/15 8:16pm: Slightly Mad says that the PS4 artifact is an additional temporal component to its anti-aliasing). 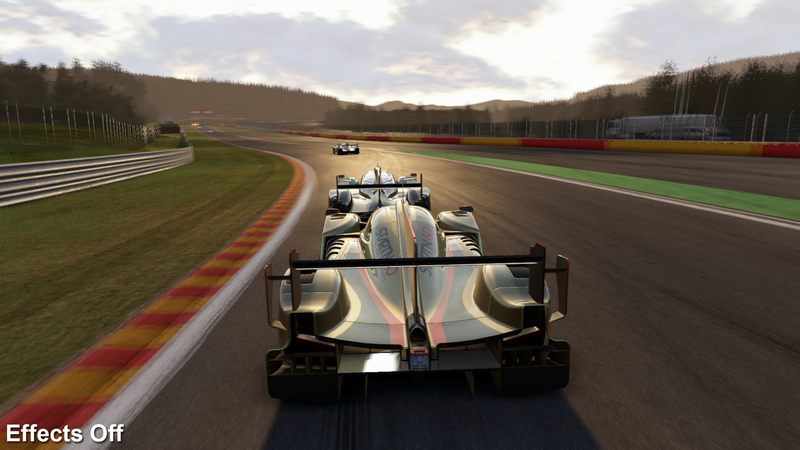 Even on update 1.01, these are two areas that remain unchanged from when we last saw Project Cars in action, and similarly, PlayStation 4 retains a quality advantage in its rendering of shadows. In terms of performance, the game has its high and low points. 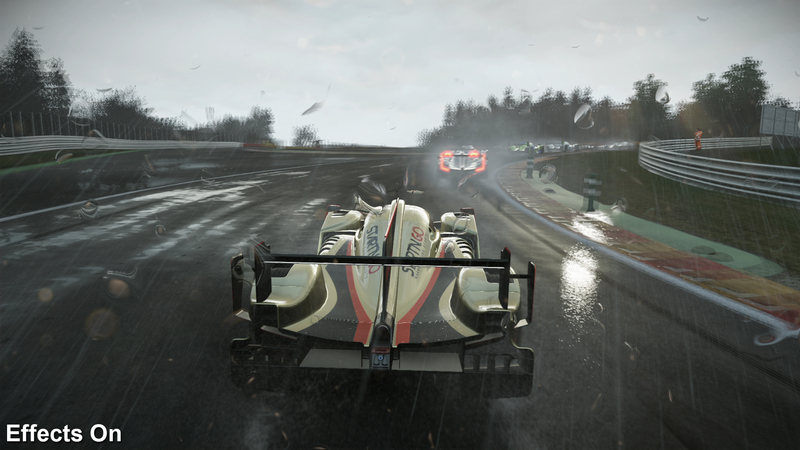 Depending on which modes you play, and how you prefer to set up your race, Project Cars hits either a clean 60fps without trouble, or tumbles down to the mid-30s with tearing - this being the very worst case scenario when pushing for the highest car count and rainy weather. To start off, we play things out the way Slightly Mad Studios intended, via the career mode. Here we have events that pre-determine the track, number of cars, time of day and weather conditions in advance, all of which sets up a fair test between PS4 and Xbox One. 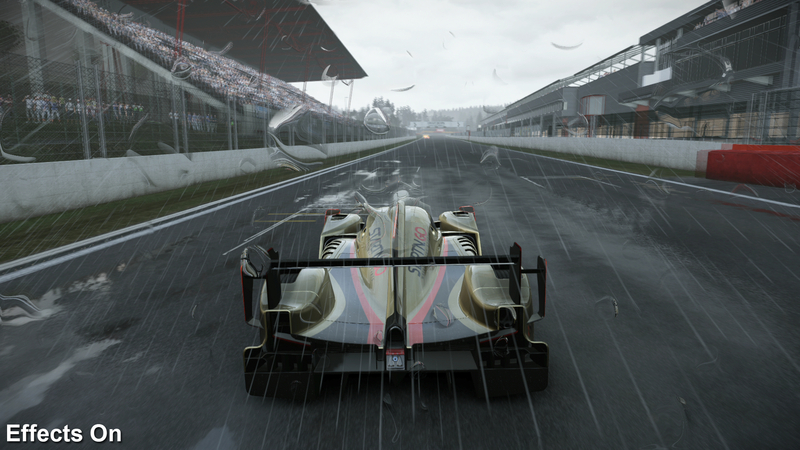 A frame-rate analysis of Project Cars' career mode. With races capped at 20 cars, both PlayStation 4 and Xbox One mostly hold 60fps in dry weather, though dips to the mid-40s are apparent when rain effects are introduced. Our first season is in LMP1 with an RWD P30 supercar - and notably the majority of races early on limit the car count to 20. Tracks like the Nurburgring and Circuit de Spa feature heavily here, with weather impressively switching between clear skies to torrential storms as we work through the laps. As for the all-crucial frame-rate metrics: the result is mostly within the 50-60fps range throughout on both platforms, with tearing helping to keep the frame-times as close to the 16.7ms target as possible. Inevitably, the initial break of cars cues some of the lower readings on record, especially when starting at 20th in the grid. However, the ascent to pole position brings with it a reduction in the regularity of sub-60fps dips, and the knock-on effect is that it leaves the front-runner with the smoothest playback overall. It's a modest test, but overall PS4 hits this peak 60fps figure sooner than Xbox One, and holds it for longer without resorting to drops and screen-tear. However, as clear skies turn to rain, it becomes apparent both consoles have an Achilles heel in their handling of weather effects. The greater the downpour, the bigger the drop from 60fps, and neither gets off lightly once the switch happens mid-race. With no other driver in sight, a cruise around a soaked Brands Hatch circuit has the final bends run at 45fps on Xbox One, while PS4 takes the lower end of 50fps. And once the pit-stop and stands are in view, this number goes even lower still, where both drop to the 40-50fps range, while the cadence of tearing becomes increasingly more aggressive. The decision to unlock the game's frame-rate is a mixed blessing, but one that ultimately benefits playability. On the one hand, it's unfortunate that the game's standout weather effects go hand in hand with this distracting artefact. But on the other, we're looking at a far more flexible read-out on our frame-time graph, allowing frames to output around 25ms even under load - as opposed to forcing frames to update at the next rung down at 33ms had there been v-sync engaged. On balance, this makes controls smoother even if the visuals do take a noticeable hit. Bumping the car count up to 45 is an excellent stress test for both PS4 and Xbox One. Using the solo mode to push for maximum cars on the track, Sony's machine is just ahead on the 24 Hours of Le Mans circuit to start - but it's clear both struggle when rain effects are also introduced. With this as a reference point, we next jump into the solo mode to tweak the game's settings ourselves, in a manual fashion. Here we run with all post effects engaged (besides heat haze and vignette, which are disabled by default), the chase camera set to the standard 80 degrees, while car destruction physics are enabled. We also push the car count to 45 on the 24 Hours of Le Mans circuit (one of the few where this is possible), and set rain as our weather of choice. The side-effect of pushing the engine to such an extreme is a bizarre one: the differential we see between PS4 and Xbox One in most races begins to disappear. With all vehicles visible ahead on Le Mans, both consoles lurk around 35fps on this circuit as we pass the stands, and frame-rates remain neck-and-neck until we cross the finish line. Given the PS4's strengths on the GPU side, there is an evident trail-off in its benefits with so many cars on screen. In this case, a CPU bottleneck is the likely culprit given the commonality in this area between the two consoles. By comparison, tracks like Imola and Azure Coast show a clear PS4 advantage, even with the car count cranked up to a lesser 31 and weather effects engaged. In this case Sony's platform glances the 30fps line only briefly as its very worst case, while Xbox One slips just below it. Elsewhere the margin is as wide as 15fps in favour of PS4, and the heavy alpha effects used for rain sees the Xbox One buckling more noticeably. 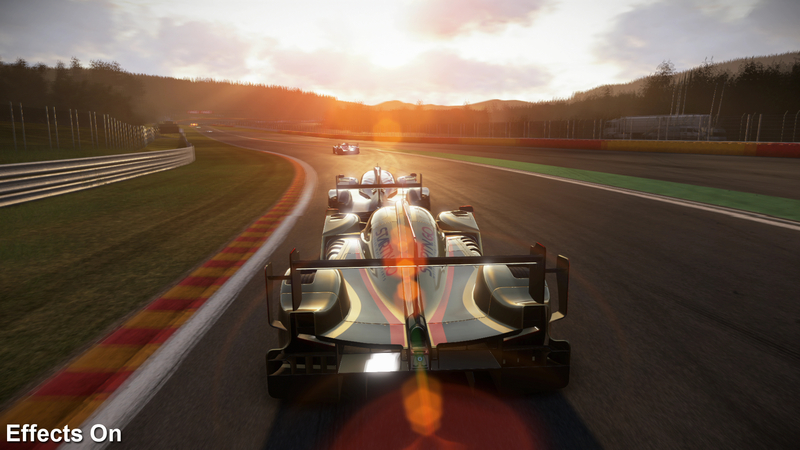 It's an expected outcome given the sheer scale of the task, and impressive in the context of what Project Cars is doing over and above other console racing games. 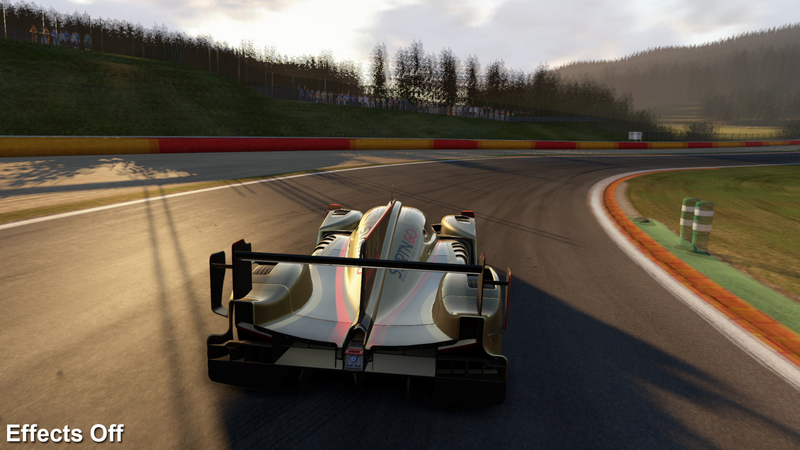 Very slight tweaks to performance are possible by adjusting Project Cars' post effects menu. Using a bottled replay, we compare two separate runs side-by-side; one with all effects enabled, the other without - the latter of which brings a lead of around 2fps on average. At this level of potential performance, an optional 30fps cap would definitely work well - if purely for these rare excesses. Alas, while Slightly Mad Studios offers a bevy of post effects toggles, the impact these actually have on the game's performance is fairly minimal; our test above shows the boost averages at 2fps once all options are disabled. The sacrifice isn't worthwhile in our view; eye-catching extras like god rays, bloom, and screen-space effects such as water droplets add hugely to the impact of the game's weather, and the gains otherwise are small. However, if you feel the need to tinker, it's worth noting that some effects require restarting the game (after saving) in order for preferences to take effect. All in all, it's fair to say Project Cars' final console build is equipped to hit 60fps in its career mode races, though the consistency of this falls hugely on its weather settings. As with our initial hands-on, heavy rain is still the cause for the most sizable drops to 50fps and lower, while races with clear skies hold much closer to the target 60fps. It's also evident Xbox One struggles to match the PS4's performance levels in most scenarios, especially with a conga line of cars in tow, where Sony's platform typically takes a firm lead. Taken purely as an assault course for PS4 and Xbox One consoles to run through, results in the solo mode are also intriguing. A 60fps lock is far from guaranteed when tweaking each settings yourself, but the freedom on offer is both impressive and welcomed for a console title. Project Cars is first and foremost a force to be reckoned with in the PC space, but the commitment to getting the most out of these console editions is apparent. Quite how the console duo compare to the PC's very best settings is something we intend to cover soon, and it stands to show how closely the team has optimised the game for each platform. Perhaps the most glaring addition is lens flare, also backed by a bloom effect which can be tweaked seperately. A heat haze effect is also available for hot, mid-afternoon races. Lighting is also embellished via the crepuscular rays option, which allows light stream through tree branches as you speed past. The colour balance is tweaked to slightly de-saturate the image, while a vignetting effect is added to the corners of the frame.